Brown Lentils and Basmati Rice are cooked together along with onions and fragrant spices; a lighter version of the traditional middle eastern mujaddara. I have updated my previous post (Curried Cranberry Beans) with the picture of the Cranberry Beans. The luxury of the holidays are over; back to school, back to work and back to squeezing in the best of everything in a healthy bowl in 45 minute. It has to be quick (for me ), & good looking and delicious (for everone else who gets to eat it). I made this for a quick lunch and had the pilaf with mint raita (mint flavored yogurt). This pilaf tastes almost like mujaddara, but I have used less lentils than it is usually used in the traditional Middle Eastern dish, and have not taken much time to garnish elaborately with caramelized onions. Even after the differences it was pretty good and wholesome – vegetables, protein and carb. cooked all together and quickly, what more could you ask for? Wash the rice and drain repeatedly till the water runs clear. Soak the rice in cold water for about 1/2 hour. Wash and drain the brown lentils. Soak the lentils in water for at least 1/2 hour. Heat the Ghee/Butter/Oil in a thick bottomed pan. Add the clove, cardamom and cinnamon; when they are fragrant (in less than a minute) add the cumin seeds. When the cumin seeds start to sizzle, add the sliced onions and fry them till they are tender and start to brown on the sides – for about 10 minutes. Do wait till they are slightly brown, for at this stage the onions start getting nicely fragrant. In the mean time, drain the rice and the lentils and set aside. When are onions are limp and light brown, add the rice, lentils, carrots, salt, saffron, turmeric and toss them all together and cook for till the ghee/butter/oil coats everything well for about 3-4 minutes at medium heat. The rice will glisten and shine and will start to look opaque. Add 3.5 – 4 cups of water and cook over medium heat uncovered till all the water from the surface is gone. All you will see is the long half cooked rice. At this time, cover the pan and switch the heat of the stove to the lowest. Cook covered at low heat for about 5 minutes and them switch off the heat, but do not uncover yet. Let the rice cook in it’s steam. Uncover when ready to serve. Stir in the chopped parsley or cilantro and fluff the rice with fork. Serve hot with yogurt or salad, as a side dish or as main meal. Chilly, frosty outside and a warm bowl of steaming fragrant pilaf – nothing but delicious. Another nice way to use this rice if there are left overs would be to use as stuffing in tomatoes, whole chicken, peppers etc. I have got to try that next. January 7th, 2010 | Category: Main, Entrees etc, Rice Dishes, Sides & etc. Colorful, healthful and tasty dish to have. Pics look wonderful. This combination is a must have once a week, I usually use moong,toor or cow peas. I have to find myself some brown lentils. Like the combo of lentils and rice together. Looks very colourful..
Looks gorgeous! Love the colour! Piéaf is so tasty and versatile! That one looks just perfect! Your rice looks very colourful and delicious.Lovely photographs. Looks quiet colorful with all colors! Soma, its like you read my mind. 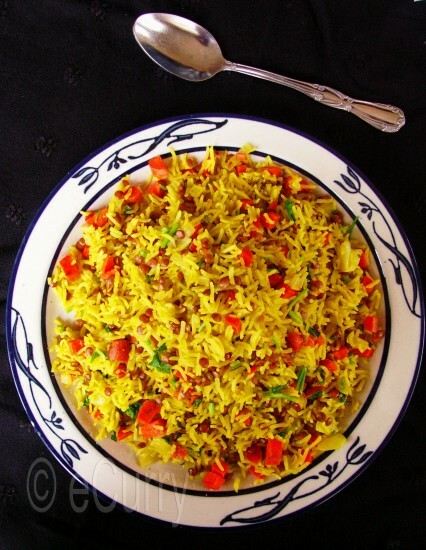 I have been thinking of making pulao but this version with the brown lentils looks so good. I am off to the kitchen now to soak some lentils. Looks so beautiful and delicious! very nice pics. I make something similar with masoor dal also inspired from a bengali recipe:). The plateful looks extremely appetizing! I don’t know if I said this before but I find myself bookmarking every other recipe of yours and then decided I will just come here first if I need to cook up something interesting. Have some brown rice rotting away! Very lovely done pulao….loved the separated granules of it…. 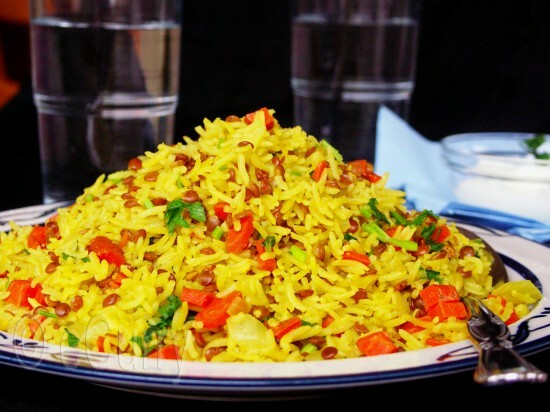 The pilaf looks so wonderful, would just love to have some. Thanks for updating the cranberry beans post, I think I can search for it now. Don’t know the Bengali name for it, so I think need to search it myself at the nearby store. If you don’t mind, I would request you to please send this lovely post for the Monthly Mingle – Winter Fruits and Vegetables that I’m hosting for this month (deadline 11th Jan). Love that pilaf, looks beautiful. look at those colours….absolutely stunning! Lovely and colorful Pilaf and thank you for the Cranberry Bean Pic. 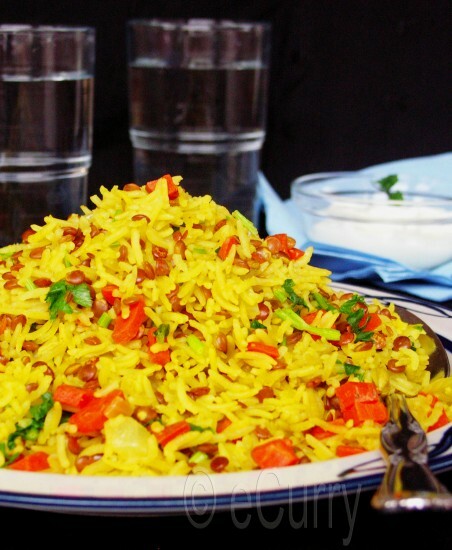 A great combination of rice & lentils and the spices, delicious pilaf! Pilaf looks fantastic soma! Havent made pulav using brown lentils, must a try for me now! Nothing quite like a one dish meal in when time is short. This one looks delicious too. Delish! Rice and lentil dishes are my daughter’s favourite. I love such hearty meals so much. It looks absolutely inviting. Rice looks very pretty and exotic! Isn’t it wonderful to see different kinds of mujaddara. In Cyprus we call it moudjentra and it’s more lentils and less rice. This one looks very appetizing. thats a real good dish Soma. I would defnitely trythis out. but we dont get brown lentils here. what do you think could be a good substitute for that? will masur dal work? please let me know. We have a similar dish in Colombia, but we add coconut milk to the recipe. That looks delicious! Great flavors. Your Pilaf looks sooo good girl. It is always a winner in my kitchen! Your pic. looks so vibrant and delish! Then again everything you make is spectacular! Love this cool idea, it is a one pot meal and has the goodness of carb, veggies and protein. Thanks for this Soma, i keep looking for these easy, nutritious ideas. Yes, that is what I have used here. They do not cook to a mushy consistency. They are cooked thru’ but stays kind of nutty. That is the reason I use the one with the skin. When i am making pilaf i don’t like them mushed up like khichdi. Treat to eyes, tastebuds & tummy….. This is exactly the kind of dish I’ve been craving lately. Looks delicious! bristi r raatey aar ki chayi??? aaj eta banabo…gorom gorom khabo ! Everything you do seems a work of art. This looks like it would be so wonderful on my plate, must try this soon. Could not find brown lentils, could only find green lentils. Then I saw a packet marked green/brown lentils, so I am assuming green & brown lentils are very similar or the same thing, is this correct?. Bumped into this recipe in a web search for an “indian lentil pilaf” and I really liked it. I found that it took quite a lot of salt to bring the flavors out, plus I added a big squeeze of lemon at the end, which really offset the lovely buttery feel of the pilaf. Thank you!